on October 1, 2012 at 6:05 am We Need to Reform Poorly Designed Entitlement Programs | . I thought we already had that. It is one of the main reasons for our ballooning debt. Best place to start with cutting government is the security state which comprises at least a third of federal and state spending. While most of the households who pay no tax have low incomes many accountants and lawyers make excellent incomes from helping high income households reduce their tax bills. Low income households do pay Social Security taxes. Corporations move profits off shore to reduce their taxes – some to the point that they receive tax refunds. General Electric is one of the most sophisticated “accounting” firms in the US employing many ex IRS and Treasury people. A significant part of today’s deficit is caused by our low historical tax revenues. Over and over we hear the argument that the ‘rich’ need to pay their fair share. With close to 50% of the population not contributing at all it’s actually the ‘poor’ who need to pay their fair share. Dan, your logic escapes me. You want no income tax and your upset that some people don’t pay income tax? This is a good thing. We should extend it to everyone. And those people for whom government is “free” still pay payroll taxes, and sales taxes directly and indirectly pay property taxes and corporate income taxes and plenty of others. Surely the problem is not that they pay too little taxes, right? from the ways|means committe chair website. committee chair’s opinion on a 2 pg memo from the jt. committee on taxation. looks like “no tax liability” is not defined. 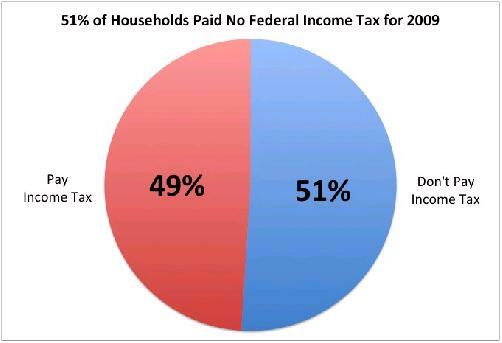 @Dan I have seen these figures described two ways, 1) as you have described where 51% of taxpayers pay ZERO federal income tax and 2) where 51% of taxpayers do not pay an additional federal income tax above the amount that is already withheld from their paychecks. Can you provide a link to where you got your data so that I can argue against those who think option 2.